It's been a demoralising spectacle watching senior Labour politicians attempt to announce their 'fiscal credibility'. Far from being on the side of the economics gurus, the two Eds have lined up with George Osborne as austerity enthusiasts - to be condemned by Nobel Prize winning economist Joseph Stiglitz. The last time we had a consensus such as this was the 1930s, and Unite general secretary Len McCluskey was right to invoke the spectre of Philip Snowden in his Guardian article today excoriating the two Eds. McCluskey's riposte was in response to Ed Balls' Fabian speech on Saturday, and various media interviews, during which he said: "There is no way we should be arguing for higher pay", and supported the pay freeze followed by pay restraint policy of the Tory-led coalition. Indeed with failing consumer demand and rising living costs, why would higher pay be important? Best to just drive wages down to ensure what? More loan and mortgage defaults, less consumer demand and VAT revenues, lower income tax revenues, more stress, anxiety and suicides (that inevitably accompany money worries). "Len McCluskey is entitled to his views but he's wrong. Im changing Labour so we can deliver fairness w less money.That means tough decisions"
Less money? Really? Rolls Royce and Bentley sales are up over 30% in the last year, while executive pay shot up by 49%. The tax gap is £120bn, the money's there - you just need to get it. Tough decisions? Really? Why not take a 'tough decision' to scrap Trident, cancel Osborne's proposed reductions in Corporation Tax or raise the 50% tax rate to 60%? 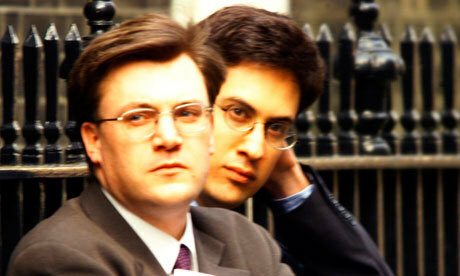 So the two Eds weren't being credible, just capitulating to the Tories failed economics of austerity. They weren't making 'tough decisions' either, just ones already written for them by the leader writers of the Times and the Telegraph.